A preview of Morgan & Rhys’ intimate Naramata wedding. These two might be considered a rare breed of couple these days, having known each other for ages and dating since they were both in Grade 10. For them, it was important to celebrate with their family of course but also alongside the large friend group they’ve known for decades. They felt drawn to the old world aesthetic of the Naramata Heritage Inn and the charm of the Okanagan wine country. Although nature decided to create a less than ideal situation with the wildfires in both Naramata and the surrounding areas, it wasn’t my first time grappling with this type of light and atmosphere (see: God’s Mountain Estate wedding in Penticton). And thankfully the couple handled it all with a lot of grace and positivity as we explored the smoky landscape together. 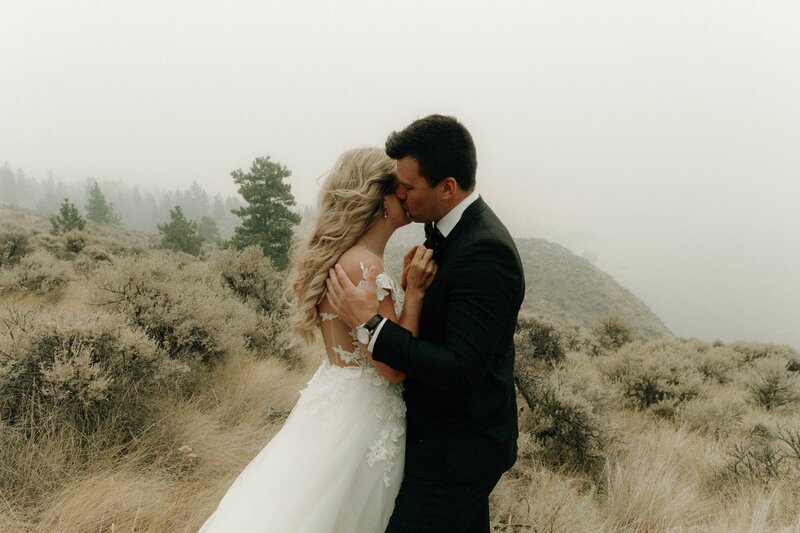 I wouldn’t have expected any less from the spirited soul that is Morgan and the gentle giant that is Rhys who embraced the otherworldly feeling the smoke created during their Naramata wedding and the images that would result from our time together.